We’re spending the day skirting the English channel before heading across Normandy to Rouen, former home of five-time Tour winner Jacques Anquetil and famous for Claude Monet’s paintings of the façade of the cathedral. Gustave Flaubert’s Madame Bovary, about a hopeless romantic and a mediocre doctor, was also set nearby. Our lawyers told us not to make smart-arsed comparisons with professional cyclists. 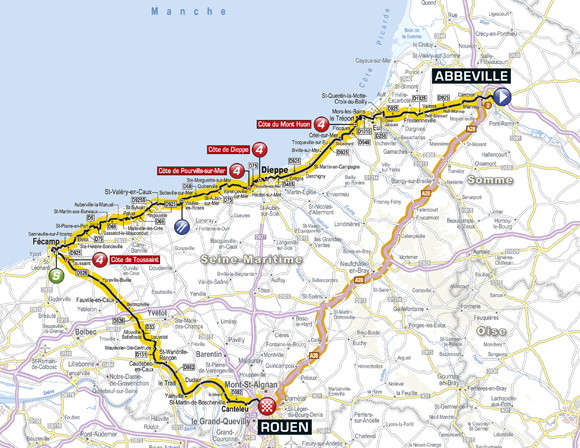 The route heads straight to the coast from the start in Abbeville. You’d think it would be a nice flat run, but the coastal road here specialises in what’s known as “French flat”, which is constantly rolling, climbing and descending straight over the hills, rather than going around them. There are four categorised climbs to cover, before a sharp left at Fécamp and an exposed ride back east to Rouen. It depends entirely on the wind. If it’s blowing hard in the prevailing direction, from the west, that left turn at Fécamp could blow the race to smithereens. If not, the sprint will be difficult to prevent. That pinch point at Fécamp might be interesting – the bonus sprint happens there, then the bunch climbs the final category four ascent, and hits the open plains. Pont l’Evêque, for the first cheese of the Tour. Plus a post-prandial Calvados and a late morning the next day. If the crosswinds are a problem, the final hour and a half should be very exciting. Michael Wright gained a brilliant second place, but the glory, as well as the stage win and the yellow jersey, went to Felice Gimondi, the greatest revelation of this season’s racing. It was a monotonous stage, broken only by the 90-mile breakaway of Novak and Bodin, who pushed their lead to 10-40 over the sleeping bunch. But when the aces decided, with 35 miles to go, that they had been there long enough, their lead melted like snow in the sun. Roger Pingeon, Simpson’s team-mate, launched the decisive break, quickly followed by Simpson himself, Wright, Bracke, Darrigade, Gimondi and five others. Would old Darrigade, the 36-year-old veteran, win his 23rd Tour stage? The finish was at the top of a long hill, and this changed the face of things. Bracke shot to a 10-metre lead, but Gimondi got up to him after a furious chase. The Italian did not stop at that, he kept his effort going, and held on to a few seconds lead. And so the victory – and race leadership went to the man who most deserved them, while Wright had to content himself with second place. – Rouen has hosted 16 stage finishes of the Tour. The first time was in 1949 when Lucien Tesseire won. The last time was 10 years ago, when Jaan Kirsipuu won a sprint. – Rouen has also hosted the Grand Départ of the Tour on two occasions. In 1961 the Tour started with a road stage from Rouen to Versailles, won by André Darrigade. In 1997, Chris Boardman won the Rouen Prologue. – Rouen is one of only three towns to host both a start and a finish at the 2012 Tour – Liège and Pau are the others.